Matte Acetate for graphic overlay and protection of art work. Also may be used to create tole painting and decorative painter patterns and stencils. 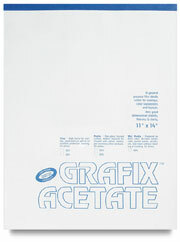 Acetate is available in sheets, pads or rolls. A piece of copy paper is about .004" thick. We do not stock the following acetate products but we are able to order for you. Our shipments usually arrive on Tuesdays and Thursdays around 11:00am if our supplier has it in stock.